Interesting: I think of "limiting factor" as a basic scientific/troubleshooting concept, like Occam's Razor, or the idea of testing for both success and failure, and have no recollection of where I first heard of it. 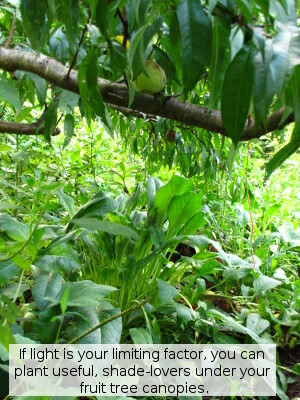 Emily --- I was actually thinking, as I was writing this post, that some permaculture author should write a short ebook describing the limiting factors that would make all of the most popular permaculture techniques feasible or problematic in specific situations. Josh --- I can't really remember when I learned about limiting factors --- whether it was specific to ecology or not. I'd be curious whether other people got the concept in basic science rather than in ecology class. The concept of limiting factors is present in all kinds of interconnected systems and the study thereof. What a lot of people don't realize is that systems in different domains are essentially equivalent. E.g. a lot of different types of systems (mechanical, electrical, thermal, etc) can be described identically via bond graphs. Any system can be described using combinations of differential equitions and boundary conditions. Hey, thanks for the mention. Interesting discussion, by the way. I first remember the concept of limits in mathematics. Even before calculus, the limiting factor is present conceptually in finding the greatest common factor. That was first grade math, for me. I'm not sure if that was the basis for later being taught the ecological concept, but for some reason I link GCF with limiting factors in ecology. Roland --- I always love the way different kinds of science/math link together. When I was taking calculus and physics at the same time in high school and they were both talking about the derivatives from their own perspective, I was ecstatic. Sara --- Thanks for the great idea! I don't think of the mathematical version of limits and the greatest common factor as being similar to the ecological limiting factor, but maybe I'm not thinking about them broadly enough? In mathematics there is a rather precise definition of a limit; it is a value that a function or sequence approaches as the input (or index for a sequence) approaches another value. Most common are the limit to 0 and ∞. Note that functions do not by definition have a limit. E.g. f(x) = sin(x) will oscillate between -1 and +1 over the whole domain of ℝ. 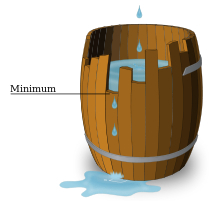 When considering limiting factors in dynamic systems the most generic name for it would be a bottleneck, I think. Roland --- Thanks for backing up my memory of limits. I think the only thing really similar is the name. And thank you for translating "limiting factors" into common parlance. You're totally right that "bottleneck" would be the proper translation! I had to think about this one for awhile, and the link I've always held between these two concepts is completely idiosyncratic. Maybe I can save face by pointing out that both phrases have the word "factor" in them. Did anyone else catch that? Turns out that I haven't been practicing first grade math all that much recently. Though I do add and subtract daily. Sara --- You made me laugh. To be honest, my first grade math is pretty rusty too, which is why I wasn't sure whether your comparison had merit. I'm reading Steve Solomon's book Gardening When It Counts at the moment, and he discusses limiting factors near the start. He uses the same "staves on a barrel" explanation. 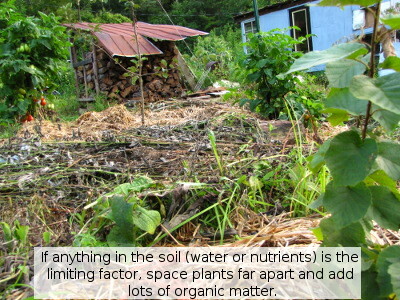 I think it's a good way to think about garden inputs (nutrients, minerals, light, water, etc). If you read books about gardening advice and biology, it's easy to be overwhelmed and start obsessing about trying to get the ratios perfect in your fertilisers etc. But really, there's likely only one or two limiting factors holding you back and it's usually fairly easy to figure out what it is (light, water and nitrogen are probably the most common, although it helps to think about the six macronutrients and seven micronutrients). This simplifies the problem immensely, so you only need to work on one thing at a time and iterate towards ideal growing conditions. 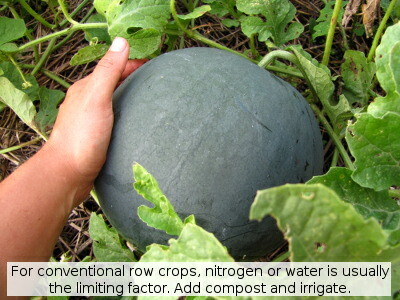 It's a good way to think about compost, too - the main limiting factors are carbon, nitrogen, moisture and oxygen. Getting the C:N ratio perfect doesn't matter if you don't have enough moisture (or too much moisture, which is really not enough oxygen). People obsess about compost recipes, but really it's a simple matter to just keep an eye on your compost pile and adjust whatever the limiting factor is over time. Now that you mention it, Gardening When it Counts may be where I learned about limiting factors in the garden. That's one of my favorite gardening books --- Steve Solomon feels like my kind of grower who's serious about both ecology and yields. Good point about applying the idea of limiting factors to compost too. I've always found in-depth compost recipes a little funny --- it seems like compost piles work pretty well by feel and eyeballing.